Our series Café Con Leche continues. This time NAHJ Online Journalist of the Year Feliciano García, who is a coordinating producer for the Today show and creator of NBC Latino’s Cafecito. An NBC Latino shout-out to Feliciano Garcia, the creator of our Cafecito segment. 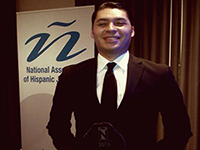 Garcia just returned from Chicago, where he proudly received the ’Online Journalist of the Year’ award by the National Association of Hispanic Journalists, known as NAHJ. Garcia is the creator, producer and host of our Cafecito segment, where he interviews prominent Latino artists, musicians, actors, activists and others and discusses their work and their lives as Hispanic Americans. From Junot Diaz to Eva Longoria to Dolores Huerta, Cafecito brings a fresh perspective to the conversation of what it means to be Latino, as well as the hard work and aspiration behind the creative process. “You learn that the obstacles these people have overcome and the passion they have to give back is nothing short of amazing,” Garcia told his colleagues at the Today show about Cafecito. “To be recognized on a national level by my peers is truly a dream come true,” Garcia said. Garcia is a coordinating producer for the Today show, and has also worked in print and radio. He was a Congressional Hispanic Caucus Fellow.